The second game of the 24th Meijin best-of-seven title match (sponsored by the Asahi Shimbun) was played at the Go-Shobo Inn in Arima Hot Spring, Kobe City, on September 15 and 16. Playing black, the defending champion, Cho Chikun, defeated the challenger, Yoda Norimoto 9-dan, by 3.5 points after 255 moves. This gave him a 2-0 lead in the title match and made his chances of defending his title look very good. The pressure is now really on Yoda, who made a public vow to win the title before the match began.The third game will be played in Atami on September 29 and 30. The final of the 8th Ryusei tournament was held in Tokyo on September 4. Yamada Kimio 7-dan, holder of the previous Oza title, was matched against Morita Michihiro 9-dan, who won the 4th Ryusei tournament. 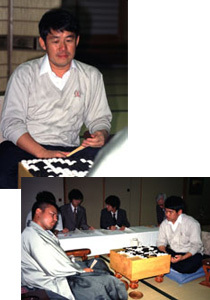 The game was closely fought, but a ko fight started by Morita turned out badly for him and so Yamada, who played white, won the game by resignation after 204 moves. The first game of the 24th Meijin title match (sponsored by the Asahi Newspaper), a best-of-seven, was played at the Kumamoto Hotel Castle in Kumamoto City on September 1 and 2. Playing white, the defending champion, Cho Chikun, defeated the challenger, Yoda Norimoto 9-dan, by 1.5 points after 240 moves. The game was an exciting struggle in which Yoda went for territory and staked victory on being able to save a weak centre group. As it turned out, he was unable to save all of it, and in the furikawari (trade) that followed Cho took the lead. Thereafter, he played compromise, safety-first moves, so the final margin was narrower than it might have been. Each player was down to the last minute of his time allowance of eight hours. The second game will be played in Kobe City on September 15 and 16. The playoff to decide the challenger for the 18th Women's Honinbo title was held at the Nihon Ki-in on September 1 between Kobayashi Izumi and Inori Yoko 4-dan, both of whom are disciples of Izumi's father, Kobayashi Koichi. Playing white, Kobayashi forced her opponent to resignaiton and so won the right to challenge Chinen Kaori for the title. The first game will be played on October 6. The final of the 21st Women's Kakusei tournament was fought between Kobayashi Izumi, the Women's Kisei, and Osawa Narumi 1-dan on August 20. Born on May 22, 1976, Osawa has been a professional for just one and a half years (she turned pro after winning the Japanese Women's Amateur Championship in 1997), so Kobayashi Izumi, who has established herself as one of the top women players, was the favourite. However, Osawa had a surprise for her. Playing white, she edged Kobayashi by 4.5 points and so won her first title in her second year as a professional. Hans Pietsch of Germany, a member of the Tokyo branch of the Nihon Ki-in, won promotion to 3-dan by defeating Hosaka Mayu 2-dan in a game in the Oteai played on September 1. Hans thus draws level with his fellow European, Catalin Taranu of Romania, who won promotion to 3-dan at the Nagoya branch of the Nihon Ki-in last year. Other promotions included that of Aoki Shinichi, the elder brother of Aoki Kikuyo, to 9-dan. The deciding game of the 24th Gosei title match was played at the Hotel Associa Shizuoka Terminal in Shizuoka Prefecture on August 26. Playing black, Kobayashi Koichi defeated Yoda Norimoto by 1.5 points after 276 moves to take the title with a 3-2 score. Of their time allowances of four hours each, Kobayashi had three minutes left and Yoda was down to his last minute. Kobayashi made a good fightback, winning three games in a row after losing the first two games in the title match. This is his seventh Gosei title (he held it for six years in a row from 1988 to 1993) and his third concurrent title. A year ago Kobayashi was titleless, but now he has made three successful title challenges in a row, for the Tengen, Judan and now Gosei, so he has well and truly come out of his slump. The Gosei was Yoda's only title, so now he will be pinning all his hopes on his upcoming challenge to Cho Chikun for the Meijin title. While he held the Triple Crown (the Kisei, Meijin and Honinbo), Cho Chikun didn't challenge for any of the other seven top titles, but now that he has lost one of them his interest in the lesser titles may have revived. In the playoff to decide the challenger for the 47th Oza title, held at the Nihon Ki-in on August 26, Cho defeated Kato Masao 9-dan and so will make his first Oza challenge since 1995. He will be facing the same opponent, O Rissei, who took the Oza title from him the. O defeated Cho 3-0 for his first major title, lost it the following year and then make a comeback last year. He will be hoping to take revenge for his defeats by Cho in the Honinbo and Meijin title matches last year. The final vacant place in the 55th Honinbo league has been decided, with Rin Kaiho making a comeback after a two-year absence from the league. Rin defeated Kanda Ei 9-dan in the final game in the final preliminary round, held on August 19. As reported earlier, the other vacant places in the league were won by Otake Hideo 9-dan, Ryu Shikun 7-dan, and O Meien 9-dan. They will join Cho Chikun, Hikosaka, O Rissei and Yamada Kimio in the league.